Music is a very important aspect in design. It can influence your thoughts, ideas, movements & so much more. I had a talk with 10+ awesome designer & Illustrator like Pete Harrison and discussed this topic. Plus you will get some tips about how to use music. For me music is very close together with design. Most of my design ideas come while listening to music. Beats and melody set the mood of my images and lyrics and speed influence my movements when designing. There is no way I can design wihtout music. It also motivates me and entertains when the im bored painting. I decided to gather some opinions and ask several top designer how they got influenced and touched by music. Im happy that I got some really good artists who have been working in the design scene for a couple of time and really know what they are talking about. I asked every one the same question. website http://iammago.com/ Music inspires me in any aspect - it sets the mood of my work when working while listening to music, it's inspiring the colors and the overall look of my work. Most of the time I listen to Rap/Hip-hop - like Jay-Z, Kanye West, Cassidy, Young Jeezy ,Lil Wayne and so on.I can't work without listening to music - it's just much more fun when you hear those beats banging while you're creating. website http://clor.net It seems to me, that music and visual art are inseparable parts. As soon as something new and interesting appears in music, styles, directions - the great number of works of modern artists, representing these changes appears. Music is the best help for imagination. I am very inspired by the spirit of such projects as Flying lotus, Fever ray, AFTA 1, Toro Y moi, Lone. In my opinion, that’s a one of the icons of todays zeitgeist. It all reminds me of the presentation of modern people focused on the interaction with the spiritual world. You can clearly see rhythm and direction. It helps me understand some streams. website http://nkeo.deviantart.com/ I cant design without music, music gives me the rest I need while working on a piece. The Type of music depends on the mood I'm in. 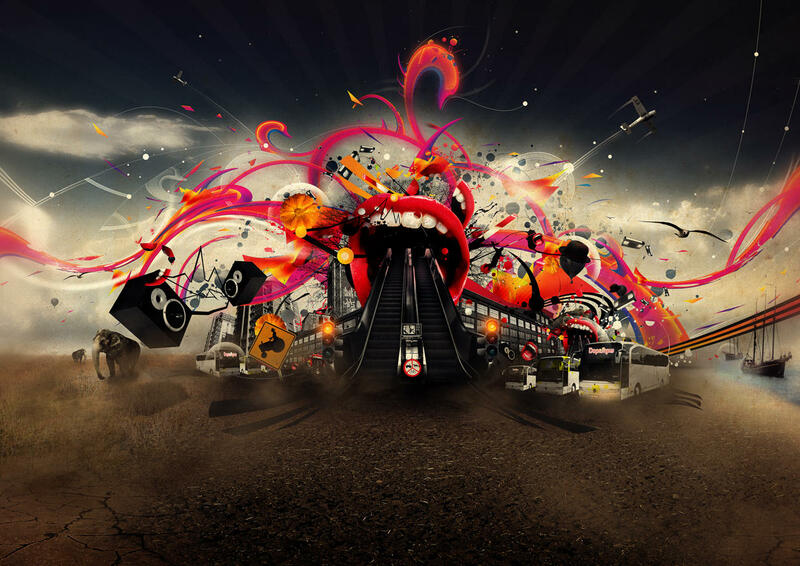 Back in the days while I made lots of colourfull photomanip's mixed with abstract I used to listen to Vocal trance. The colours I use are basicly based on the type of music I listen. Less colour means more emotive beats, more colour means happy songs"
website http://www.robshields.net/ Personally I am obsessed with finding and buying new music every week but I often design in silence. The inspiration I get from music often has more to do with the emotional content or a message that I remember. There is also a coolness factor that comes from music which helps me gauge whether or not an idea I have is over played. Otherwise I don't really feel that the territories exactly overlap. It'd be like saying I have to look at a beautiful picture every time I try to write a song. To me that's really not what its about. website: http://goabove.com "Music is an extremely crucial aspect of my day to day life. Not only when I am creating artworks but when I am grocery shopping, digging ditches, or skydiving, music always helps. When I create artworks I aim to have the music X3 times as loud as the high powered electrical tool I use. Table saws can be loud but my James Brown Funk, or Acid Trance House music always sing louder. Sometimes I get carried away and start dancing while I'm painting which can make for some interesting artworks to say the least. I'd rather be deaf than blind, but not being able to hear while looking at live music would be suicidal. I am greatful I still have my 5-senses." website http://www.behance.net/NoirMaybe Just like most other things in my workspace, I consider music a "tool" of sorts. A lot of times I find it to distracting and can't start or work on a project with it. Other times I need it to give me that boost of energy or keep me from being distracted by my environment. Most of the time I just need it to get in that sort of "Trance" where I barely notice the world around me and soon forget the music is even there. website http://www.invisiblecreature.com Music is inspiring to me in many ways. It's inspiring to hear people create new and interesting things, and that stimulates my desire to create things of my own, be it something visual or something musical. Music can inspire me subconsciously, playing in the background while I work, and it can also influence me in very specific ways, if I listen intentionally. Sometimes I'll listen to music that may directly correlate to something I'm designing, but ordinarily I just listen to something based on my current mood. Brit pop/rock (ie: Elbow, Doves, The National, White Lies, Editors) is usually the first thing I go to. website: http://www.aeiko.net/ I listen to a variety of music..and music is always on when im designing. Usually its something fast like drum and bass..something to keep me ticking, recently a lot of hospital stuff - London Elek, High contrast, Mistabishi, Logi, Danny byrd etc...but I also love faster stuff such as Spor, Sigma, Fresh, Sub Focus..its background music but keeps me working, especially in the early hours. I also love chillout and ambient sounds, for example the Desktopography albums, Tycho, Enya, BOC, Nuuro and Freshcut. Sometimes the piece that im working on can influence the taste in music, and I will try and get into the mood of what im designing at the time and just roll from there, feeling the flow. http://www.behance.net/alexbeltechi Music and Design are two faces of the same coin for me. An image is something you see, and music is something you hear, though I use both to communicate a message. Just as I appreciate and create images, I listen to and compose music. Nevertheless, I see design as my career and music as my passion. The tablet is my job and the piano key is my hobby, though I do enjoy both very much. I also tend to be critical on both. When I see a poster, I sort of critique it in my head. The same applies for music, and you'd be surprised to see that design principles apply to music as well. They really are one and the same thing, so it's no surprise that so many designers get involved in music, or at least feel a special connection to it. I usually listen to music when I design, because it drives and inspires me. My music choice is usually a range of classical, neoclassical, movie soundtracks or solo piano music. website http://www.perttumurto.com/ I usually listen music always when I work. It's kind a part of the design project in my opinion! It is a great way to close "the other world" on my mind while I work and helps me concentrate 110% on the artwork itself. I kind a like all kind of music (except R'n'B!) so it's up to my own mood what I am listening while working. It could be really hard rock or some chill out electro stuff. It doesn't really effect to the out come, it just have to be good music! Good music is always inspiring!" It sometimes appears that everything in your music library you heared thousands of times and you need fresh new stuff or it appears that you dont even have a music library. Well, thanks to the internet there are several ways to get some audible inspiration. There are online music services such as Deezer or Lala, which are really good. My favourite is Grooveshark where you add the song you'd like to listen to, to a current playlist and it's really fast. And now it is your part to tell us what music do you listen to? And how does the music inspire you? Place a comment and I am happy.